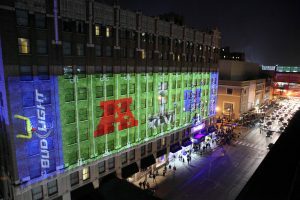 When Anheuser-Busch needed to transform The Hampton Inn in downtown Indianapolis into the “Bud Light Hotel” for Super Bowl XLVI weekend, they turned to MIG’s talented team of creative and technical experts. 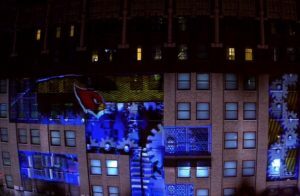 MIG’s solution was to use Image Mapping to transform the brick and terra cotta façade with projected imagery, product placement and custom animations that were seen by everyone on the street. 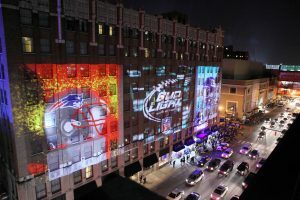 The reach of the Bud Light Experiential promotion was vastly increased by the pedestrian foot traffic. 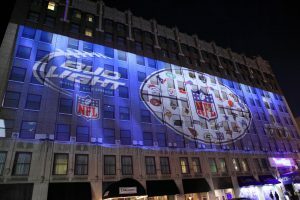 The passerbys were transfixed by the spectacular event and promptly used social media to share the experience with friends and family, creating a viral sensation, exactly as MIG and Bud Light had hoped for.